Mirrors add a fascinating element of learning and exploration to preschool art and sensory activities. If you’ve never experimented with mirror play, you really must! 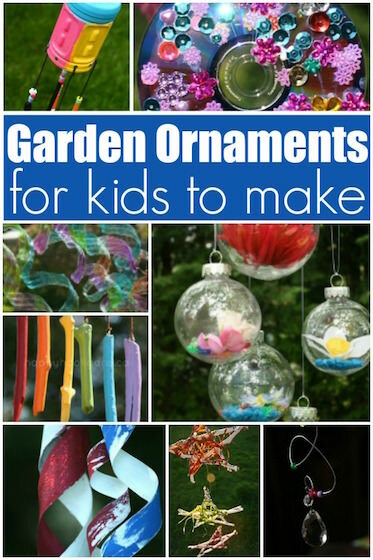 A small hand mirror from the dollar store, or a couple of mirrored tiles, or even a framed, full length wall mirror can put an entirely new spin on an activity, and captivate young children. Today, I’m sharing 5 of my favourite ways to use mirrors for play and learning with the toddlers and preschoolers in my daycare. 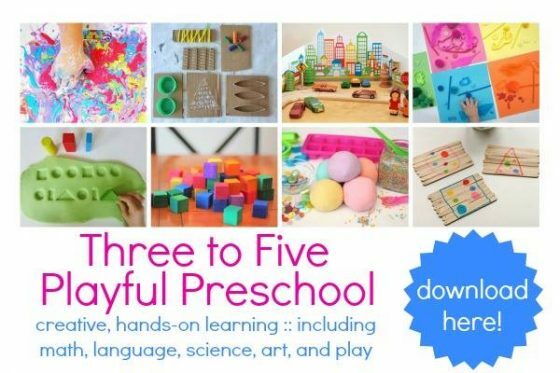 They all provide lots of fun and learning and they add an exciting new dimension and perspective to every day activities. The hooligans always get excited when they see me remove our dress-up mirror from the wall or when I get out our mirrored tiles. They love exploring and creating on a mirrored surface, and when they see those mirrors come out, they always know there’s some extra-special fun in store. Ours is a 3/4 length, framed mirror that I found at a thrift shop a couple of years ago. I think I paid 5 bucks for it. It’s not shatterproof, but you can buy shatterproof mirrors in all sizes at teacher supply stores. 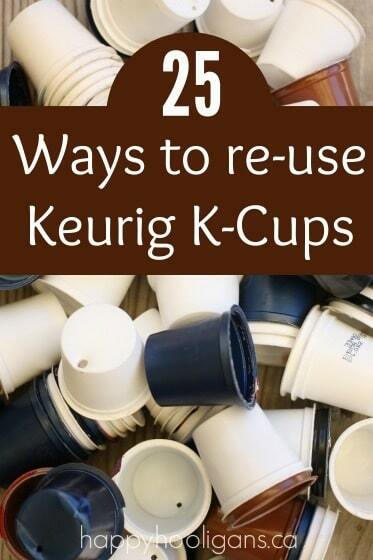 There are also have a bunch here on Amazon (That’s my affiliate link. 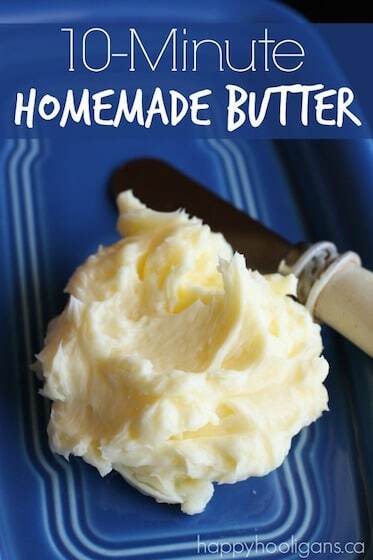 As an Amazon Associate I earn from qualifying purchases) . When we’re using our mirror for play, I place it on an old coffee table in the backyard. It serves as a wonderful surface on which the hooligans can create art or examine interesting objects and substances. 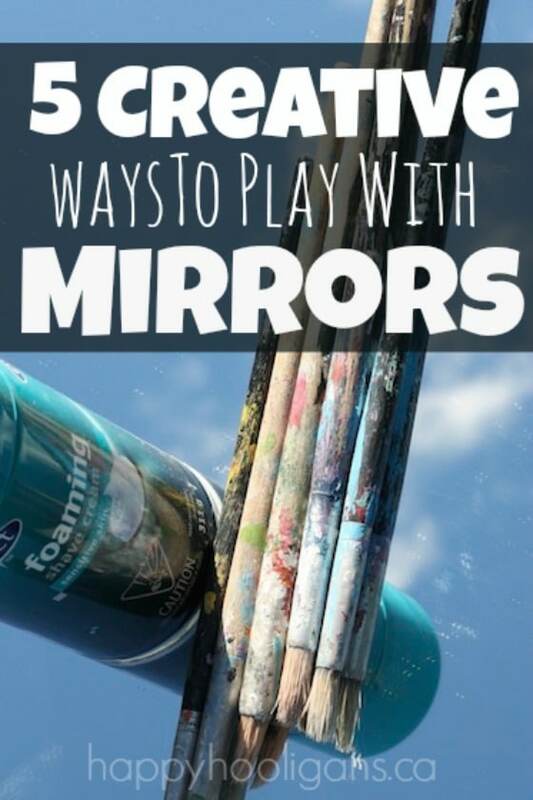 The smooth, shiny surface of the mirror is perfect for paint brushes and painty fingers to slide around on. For sensory play, the mirror produces lovely sounds too when we scatter buttons beads and beans around on it. The kids love the clickity-clackety sounds they make. The kids love to see their own faces looking back at them while they work too, and it’s very cool to see the blue sky, clouds, and leafy branches of the reflected beneath them as they play and create. Smaller mirrored tiles are great too! We also have a number of smaller mirrored tiles that I got from the dollar store. 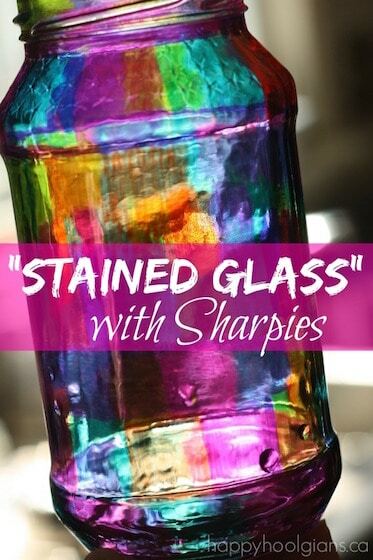 These are great for individual art and sensory activities where each child gets a mirror and some art supplies or sensory items to explore on their own. You can read more about the benefits of mirror play here. I hope your hooligans enjoy these activities as much as mine do. Click on the coloured link to see the full details of each activity, along with photos of all the fun we had. 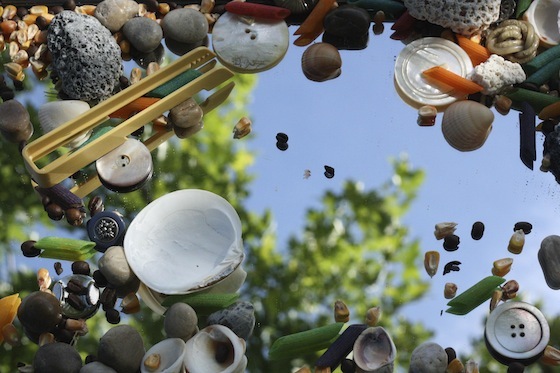 Sensory Play On A Mirror: A mirror is great for exploring small, interesting loose parts. In this post, you’ll see how the hooligans experiment with and examine a variety of small objects and instruments. 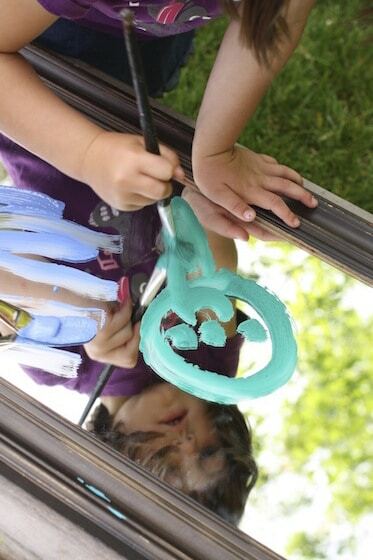 Painting Clouds on a Mirror: This is a terrific mix of sensory play and art. 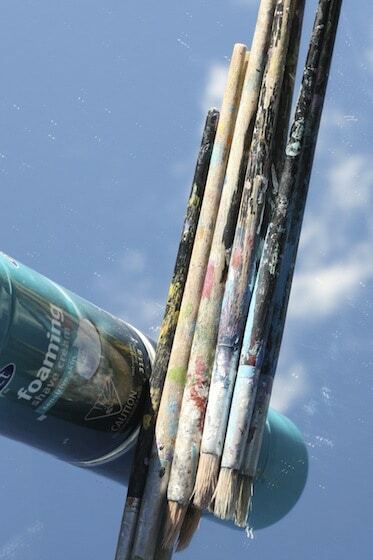 The blue sky reflecting in the mirror provides the perfect surface for painting big, fluffy clouds. 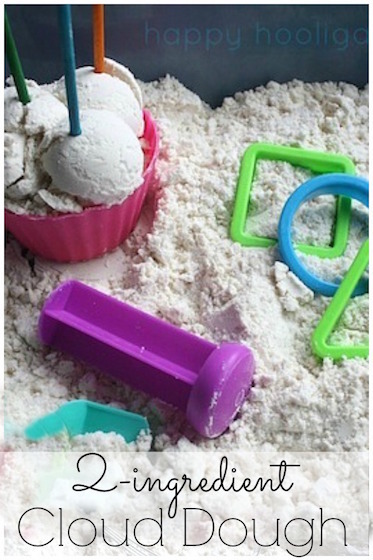 For obvious reasons, this is an absolute favourite for kids who love messy, sensory play. 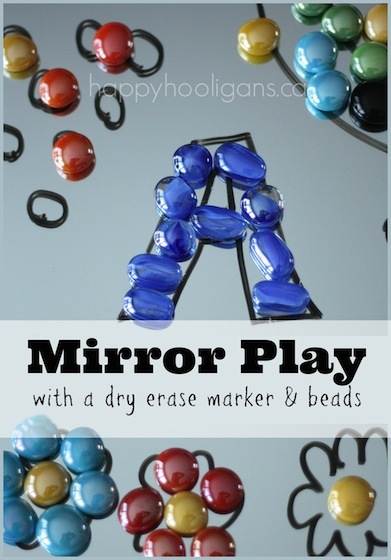 Mirror Play with Beads and Dry Erase Markers: We use small, mirrored tiles (that I picked up at the Dollar Store) for this activity. I make this activity available to the hooligans all winter long, and they spend many a morning drawing, erasing and creating on these individual, mirrored work stations. Another activity we do this way is to make snowflakes on a mirror. 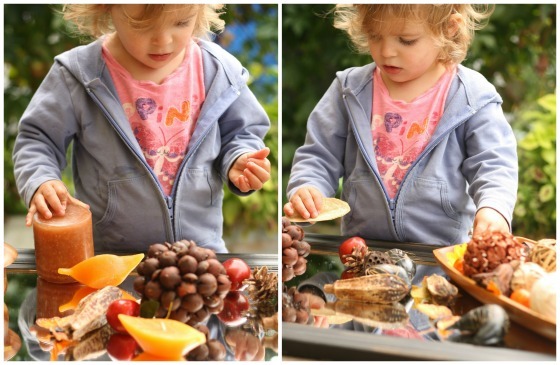 Mirrored Nature Table: A mirror is a wonderful place for children to explore seasonal materials. We use a mix of natural and artificial goodies for our nature tables. The colours and textures are made even more interesting by the mirrored surface beneath them. Painting on a mirror: Watching your lines designs and clouds appear in duplicate is wonderful when you paint on a reflective surface. The way the paintbrush glides so smoothly over the mirror is lovely too. 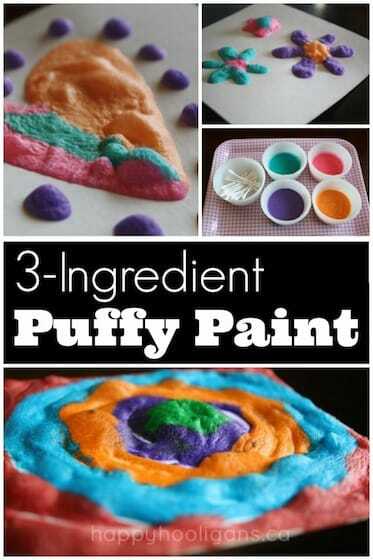 This activity always keeps the kids busy and entertained for ages. And when we’re finished, scrubbing the mirror clean is another fun activity in itself.